At the core of all we do as a Church should be our love for God and people — the greatest commandments according to Jesus (Matt. 22:37-40). Hence, at the core of strategic planning should be helping people fulfill that purpose to love God with all of who we are and to love others. All processes we develop should both reflect and promote that love. All steps we propose and decisions we make should align with and lead to such love. “Strategically plan to help people love God and others?” you might ask. When we walk, we intentionally place one foot in front of the other with a destination in mind. We don’t come into this world walking as babies. We learn to walk, usually under the guidance of adults in our lives. And so, as church leaders, we strategically plan to help people love God and others. “consider how” – Strategic planning begins with assessment. We need a thorough understanding of how to get to our destination, in this case to “love and good deeds”, which requires that we observe and discover what is needed to get there. “spur on” – Strategic planning points the way to accomplish our objective. The Greek word for spur suggests incitement or provocation. Think of how animals are prodded with a stick to get them on the right path. Similarly, we put structures in place that lead people to loving God and others. The purpose of strategic planning should be lining up with our primary purpose to love. Yes, strategic planning results in having a course of action, steps to follow. But, if we truly want to lead in accordance with the basics of life in Christ, we must arrive at the higher objective in all we do, that of loving God and people. 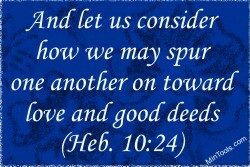 And so, we aim at spurring people on “toward love and good deed” through our various strategies. The pursuit must be intentional as we develop our plans. We must “consider how” to reach our higher objective not just how to organize a program, project, or event. The process used to get somewhere matters. The idea of walking in the way of love suggests it becomes a lifestyle, something that permeates all we do. Manipulation, coercion, and the like cannot be part of spurring one another on as those practices fail to pass the litmus test of love. Trust God Yet Consult with Others? This entry was posted in Strategic Planning . Next → Next post: Records & Reporting Point Back to God’s Grace?